On a recent evening, conductor Leonard Slatkin lifted his baton and signaled the downbeat for that unfailingly lovable Baroque chestnut, Pachelbel's Canon in D. The music, played by 21 members of the Detroit Symphony Orchestra, was far less surprising than the venue  but that would have been the case even if they had launched into a Lady Gaga medley. The site of this concert was the Matrix Human Services Center, a former church in northeastern Detroit; the audience was a collection of some 70 residents of one of the city's poorest neighborhoods, all of them African American, many of them confronted with classical music for the first time. 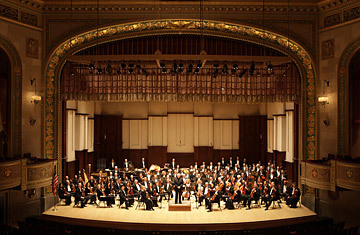 If it seemed like an awfully small audience for a performance led by one of the U.S.'s best-known conductors, the loud clapping and hearty cheering suggested that such music might have a future in Detroit after all  even with the city's excellent orchestra drowning in debt, its labor contract up in the air, its corporate donors largely tapped out and its government support reduced to nickels. The DSO is suffering the same hard times plaguing many of the nation's other symphonic ensembles. As one attendee at a recent League of American Orchestras meeting in Atlanta tweeted, "Anyone else at #Orch2010 catch the irony of including a performance of the Verdi Requiem in the conference?" But everything related to the economy is magnified in Michigan, where the unemployment rate is a stomach-churning 13.6%. Other local cultural institutions are struggling too. The Michigan Opera Theater is staggering under $20 million in debt. The Charles H. Wright Museum of African American History is tightening its belt for the fourth straight year. The Detroit Institute of Arts, the city's most widely renowned cultural jewel, is audaciously  and riskily  planning to ask the region's voters to add what may turn out to be as little as a fraction of a penny to the property-tax rate to keep its doors open. But in southeastern Michigan these days, even so tiny a tax increase can look enormous. Since the orchestra was founded in the 1910s, its fortunes have paralleled the city's. As one of a chain of orchestras that, with other public institutions, lent cultural cachet to the booming Midwestern cities of the early 20th century, the DSO was a vibrant presence at the center of southeastern Michigan's public life. But as the economy took a sharp dip in the early 1990s, a cash-flow pinch almost brought the organization to its knees. By the beginning of the new century it had come roaring back, putting together a strong run that culminated in 2003 in the $60 million renovation of the Max M. Fisher Music Center, a multipurpose facility wrapped around the DSO's 90-year-old jewel box, Orchestra Hall. In 2008 it lured Slatkin to Detroit from his 12-year tenure with the National Symphony in Washington. It commissioned original compositions rooted in the city's DNA, among them MotorCity Triptych, a robust, brightly colored orchestral suite by Michael Daugherty, and a sprawling oratorio of substantial power, Dear Mrs. Parks, by the jazz-classical hybridist Hannibal Lokumbe. But Slatkin had barely picked up his baton when the economy crashed. Corporate contributions dived 52% from 2008 to 2009, which helped precipitate a $4 million raid on the DSO's postcrash endowment. From March to October of last year, Anne Parsons, the DSO's president and CEO, conducted three separate rounds of layoffs. This year the orchestra's operating deficit could reach $5 million  and that doesn't include the $2.5 million annual debt service on the renovation, under a loan whose terms the DSO is trying to renegotiate. Nearly 10 years ago, the orchestra received a $1.6 million grant from the Michigan council for arts and cultural affairs; this year the state check amounted to $20,000. But it's unlikely that the 85 members of the orchestra will be forced to pack up their instruments. For one thing, Bank of America and the DSO's four other lenders aren't particularly interested in owning a concert facility in midtown Detroit. More than that, though, Slatkin, Parsons and the DSO's players are working to reinvent what it means to be a symphony orchestra in 21st century America, convincing new audiences that such an institution is an essential part of a city's personality. See 10 things to do in Detroit. See pictures of Detroit's beautiful, horrible decline.